I am so pleased with this product. 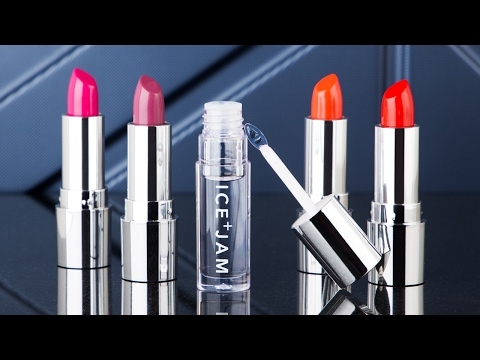 The color lasts longer than any other lipstick I have used regardless of price. It feels good on my lips too. I choose a color that I did not think I would like, but it does complement my skin tone. It will be interesting to see what happens with the color when I tan during spring break. 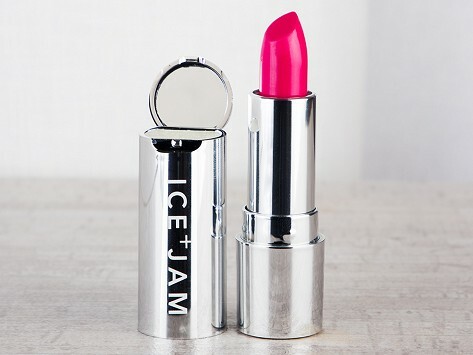 Ice +Jam is even better than expected. The colors match the ad and the smooth application are great. The bonus mirror and lip balm attachments are genius. I do love this color and how it feels BUT a bit pricey for what it is. I thought it would last longer but the need to reapply is often. It is also impossible to get the "bonus" lip balm that is located in the flip top. I can't get it out at all. Do not waste your money on this lipstick. The "Cupuacu Butter" under the flip-up top is as hard as paraffin wax. The peachy-pink color, which I would say is more pink, is labeled on the box, "OUCH, OUCH YOU'RE ON MY HAIR!". It should read, "Ouch! Ouch! You just wasted $23!". I'm very disappointed The Grommet is selling this and will rethink future purchases. I love the sleek packaging and cool flip top with mirror. Unfortunately the Capuacu butter in the top is so hard it's impossible to get any out. If you keep it in your pants pocket it warms up just enough so you can use it...at least a little bit. That said, I love the sheer pink lipstick and am a fan of the pretty color.